In response to attempts by the Turkish government to defend a state of emergency currently in effect in Turkey by making comparisons to France, French Foreign Minister Jean-Marc Ayrault on Monday rejected any similarity between the two, saying that in his country the courts are independent, even during the state of emergency. 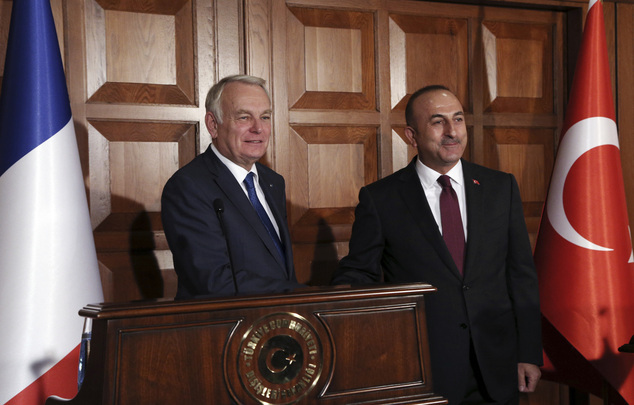 Speaking during a joint press conference in Ankara with his Turkish counterpart, Mevlüt Çavuşoğlu, the French foreign minister also said that unlike in France, the police in Turkey have been given extraordinary authority during the state of emergency. According to Ayrault, the police have to respect the rule of law and take basic rights and freedoms into consideration during a state of emergency and that due process should continue to be observed. The French minister also mentioned the importance of the right to appeal for suspects even under extraordinary circumstances. Under Turkey’s state of emergency, tens of thousands of people have been detained and many find it difficult to exercise their right to a defense since lawyers are also intimidated by the prospect of facing charges of supporting terrorism. This article originally appeared in Turkish Minute on October 24.